I've been a long time admirer of Gregory O'Brien's facility with words, and his ability, in particular, to decipher the sometimes mysterious world of art; his poetry and printmaking are also superb. He's written two previous art books for AUP - Welcome to the South Seas (AUP, 2004) and Back and Beyond (AUP, 2008), both winners of the non-fiction prize at the children's book awards, and it wouldn't surprise me if this book takes that same prize this year. 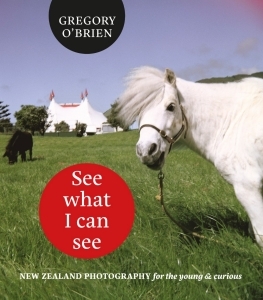 This book should certainly be a compulsory addition to every school library's book shelves, but in fact every household has something to gain from Greg's insightful explanations of the whys and hows of New Zealand photography. Photography is available to everyone these days and this marvellous book explains its many facets and shows the work of New Zealand artists from the very early days to the selfies of the present. The explanations of methods and meaning behind the diverse range of images are easy to understand and will develop the readers understanding and enthusiasm for this versatile artform.